The New Rules of Work (2017) is the definitive handbook for navigating the modern workplace. 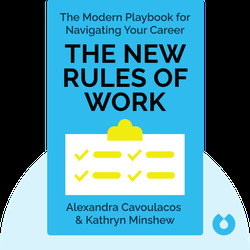 Authors Cavoulacos and Minshew recognize that the way we work has changed in tandem with the advancement of technology and that the way we think about career paths has evolved accordingly. Modern workers expect a job to do more than just pay the bills – work has to be fulfilling, too. 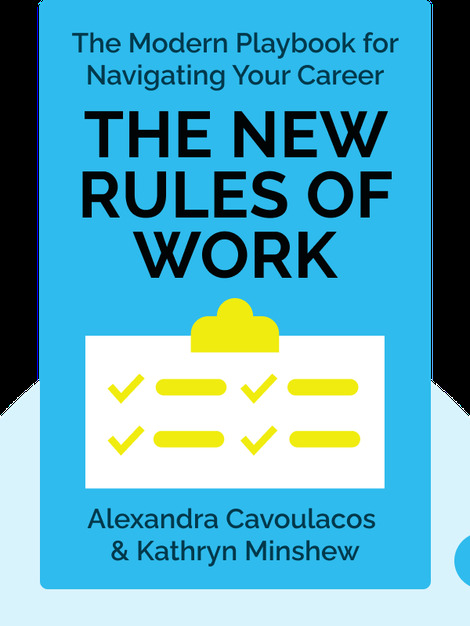 Their New Rules will help you discover the career that fits you best and give you the tools to succeed in the modern job market – from application to promotion. Alexandra Cavoulacos and Kathryn Minshew left jobs in management consultancy to found the careers website The Muse. They’ve been placed on multiple lists of the most influential people in tech and business, including Forbes 30 Under 30 and Business Insider's 30 Most Important Women Under 30 in Tech.